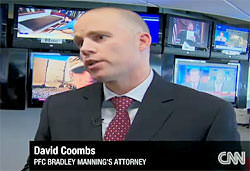 By David Coombs, attorney for Bradley Manning. I. The Military Process: The basic structure of the military process is similar to any criminal trial in a civilian court. Once allegations are made, the government begins to investigate the alleged crime. The government’s investigators are usually either Military Police Investigators (MPI) or Criminal Investigation Division (CID) officers. These individuals interview the key witnesses, secure all available evidence, and create a report that details the nature of their investigation. Based upon the investigation by MPI or CID, the government prosecutor (Trial Counsel) then discusses the case with the soldier’s chain of command. The trial counsel will typically recommend to the command the possible charges that could be preferred against the individual soldier and discuss the likelihood of success at trial. II. Charges have been Preferred: Once charges are preferred against a soldier, each level in the chain of command will make a recommendation as to what level of court-martial should hear the soldier’s case. The command can recommend a Summary Court-Martial, a Bad Conduct Discharge Court-Martial, or a General Court-Martial. Each level of court-martial has different maximum punishments that it is authorized to impose. If the charges against a soldier are serious, such as in this case, then they will be most likely be heard by a General Court-Martial. In any case where the command has recommended trial by General Court-Martial, the Brigade Commander will direct that the case be first investigated by an Article 32 Investigating Officer. III. Article 32 Hearing: Unless a soldier waives this right, no charge may be referred to a general court-martial until a thorough and impartial investigation into the basis for the charge(s) has been made by an investigating officer. This pretrial proceeding is known as an Article 32 investigation and essentially serves the equivalent function of a grand jury indictment in a civilian jurisdiction. At the Article 32 investigation, a soldier is able to call witnesses on his behalf and to cross examine the government’s witnesses. The Article 32 hearing is a means to evaluate the strengths and weaknesses of a case as well as to determine the appropriate disposition of any specific offense. At the conclusion of the Article 32 hearing, the investigating officer will make a recommendation to the convening authority. This recommendation is not binding on the convening authority. It is simply for the purpose of giving advice to the convening authority. ** PFC Manning’s case is currently awaiting an Article 32 hearing. Based upon several defense motions in this case, the government has place the Article 32 hearing on hold until it can determine the classification level of the case. A preliminary classification review is currently being conducted in this case to determine the highest classification level of any relevant information. The preliminary classification review is expected to last an additional three to six weeks. Once this review is complete, the government will need to take the necessary steps to ensure everyone associated with the case has the requisite security clearance. This process, depending upon the classification level, can be a lengthy one. Once every member of the government and defense has the requisite security clearance, the government will likely begin the Article 32 hearing. IV. Court-Martial: If the case is not dismissed after the Article 32, or if there is not some other alternative disposition, then the case will go to a trial. At trial, a soldier may elect to have his case heard by a military judge alone or by panel members (jury). A court-martial has two basic phases: the “findings” phase and (if necessary) the “sentencing” phase. In the findings phase, the trial counsel presents witnesses and other evidence in attempt to prove that a soldier is guilty of the charged offenses. The defense is then able to cross-examine the witnesses and make other challenges to the evidence in an effort to discredit the witness or show why they are mistaken. After the government has presented all its evidence, the defense is given an opportunity to present evidence. The evidence presented by the defense is designed to either prove that the soldier is innocent or to raise reasonable doubt as to the soldier’s guilt. The government is entitled to cross examine any witness that is called by the defense. After the defense case is completed, the government has a limited right to submit rebuttal evidence to matters that were raised during the presentation of the defense’s case. Once all the evidence has been presented and closing arguments are made, the panel members meet privately to determine whether the government has proven guilt beyond a reasonable doubt. The panel members are generally a mix of officers and enlisted. They vote by secret-written-ballot, and in most cases, conviction on any offense require a two-thirds majority, unlike civilian courts, which generally require a unanimous verdict for everything. If a soldier is found not guilty of all the charges, then the case is over. If, however, the soldier is found guilty of any offense, then the next stage is the sentencing phase. V. Sentencing Proceeding: If a soldier is found guilty of any offense, the case proceeds immediately to the issue of sentencing. This is different from most civilian courts, where sentencing is delayed several weeks pending the completion of a presentencing report. In military cases, there is no presentencing report. Rather the prosecution and defense are expected to be prepared for this possibility and to be ready to present evidence about the soldier and the offense. At the sentencing proceeding, the defense’s goal is to receive the most lenient sentence possible. Sentencing evidence includes the impact of the crime (both on a victim and on a unit’s discipline and morale), the soldier’s duty performance history, and any extenuating or mitigating circumstances surrounding the offense or offender. The defense and government are allowed to call sentencing witnesses. After the witnesses testify, the soldier will be given at opportunity to testify. The soldier may testify under oath or may instead make an unsworn statement. If the soldier testifies under oath, the government and the military judge and/or panel members may ask the soldier questions. If the soldier elects to make an unsworn statement, then the government and military judge and or panel members may not ask questions. At the conclusion of the presentation of evidence, the government and defense are given an opportunity to argue for an appropriate sentence. After the arguments, the military judge or panel members will deliberate on the appropriate sentence. If the sentence is determined by a panel, they will again vote by written-secret-ballot, and in most cases, it will require a two-thirds majority to agree upon any sentence. If the sentence is greater than 10 years, then it will take three-fourths to agree. VI. Post-trial Matters: After the trial is complete, the court-reporter will type a verbatim transcript of the record. A copy of the record will be served on the soldier and the defense attorney. The soldier will then be given an opportunity to present clemency matters to the convening authority. The convening authority will consider the record, the sentence, the Staff Judge Advocate’s advice, and the matters that the defense presents before taking action on the case. The convening authority has extensive discretion when taking action on a case. In taking action, the convening authority either approves the findings and sentence or may change either or both of them. The only limitation on the convening authority is that he may not increase the sentence. In general, the appellate process does not begin until the convening authority has taken action. VII. Appeal: If there is an approved sentence which includes a punitive discharge (Dishonorable Discharge or Bad Conduct Discharge), or confinement for one year or more, the Army Court of Criminal Appeals will automatically review the case. The Army Court of Criminal Appeals can correct any legal error it finds, and it can reduce what it considers to be an excessive sentence. Under Article 66(c) Uniform Code of Military Justice (UCMJ), the Court may only affirm findings of guilty and the sentence or such parts of the sentence that it finds correct in law and fact. In considering the record, the Court may weigh the evidence, judge the credibility of witnesses, and determine disputed questions of fact, recognizing that the trial court saw and heard the witnesses. After review by the Army Court of Criminal Appeals, the case may be reviewed by the Court of Appeals for the Armed Forces (CAAF). CAAF is responsible for overseeing the military justice system. CAAF chooses upon petitions for review which cases it will consider, similar to Federal courts of appeal. If the CAAF does not see any issue in a case, then it will not grant review. If the CAAF does grant review, then its decision is subject to review by the United States Supreme Court. A soldier whose case is reviewed by CAAF would have to petition the Supreme Court for a writ of certiorari.